Earlier this week I posted write-ups of William Shatner’s, Connor Trinneer’s, and Dominic Keating’s appearances at Seattle’s Official Star Trek Convention. My final report on the August 24-25, 2013 convention recaps the appearances from some of the other guests I caught over the weekend, including LeVar Burton, Gates McFadden, Denise Crosby, Marina Sirtis, Garrett Wang, and Nana Visitor. 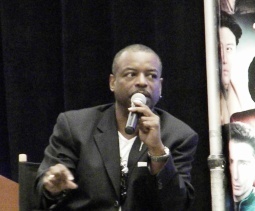 LeVar Burton, Geordi La Forge on The Next Generation, is a convention favorite, and it’s easy to see why. For one, Burton is a longtime Star Trek fan. Anyone who has attended a convention has probably come to realize that many of the actors who have appeared on the various series are not necessarily well versed in all aspects of the franchise. This is not true of Burton, who can talk the philosophy of Trek as well as any Trekker. 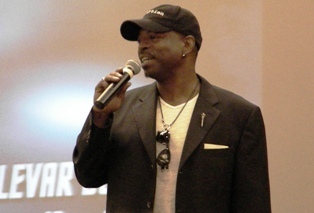 In addition to his role as Geordi, and directing a couple of Next Gen episodes, Burton has been involved in the three spin-off series. He directed episodes of eight episodes of Voyager, ten episodes of Deep Space Nine, and nine episodes of Enterprise, as well as reprising his role of Geordi on Voyager. Recently, Burton has spoken out about the J.J. Abrams remakes, and that very subject was at the forefront of the Q&A session. Understandably not wanting to create too much of a debate during his limited time on stage, Burton was reluctant to go into explicit detail regarding his take on the Abrams’ reboots. He boiled down his opinion to saying that while he finds the films very entertaining and the characters well done, he feels the films miss the essence of Roddenberry’s original vision. He feels the new movies are more about action, while the original philosophy of Trek was about exploration, discovery, and positivity. Burton is clearly passionate about his work as an actor, appreciating that fans all over the world have been touched by what he did on the show. Particularly moving to him is all the letters he has received from people with disabilities. Knowing his character has been an inspiration to people makes his work on Star Trek all the more meaningful. However, Burton cites his work with Reading Rainbow as the best thing he has ever done. Burton hosted the show from 1983 to 2006, and is still involved with the organization. He excitedly told the audience that Reading Rainbow is keeping up with the times, having recently launched a new app available for iPhone and Android. Also representing the Next Generation crew was Marina Sirtis (Troi), Gates McFadden (Dr. Crusher), and Denise Crosby (Tasha Yar). The three actresses comprised a very entertaining panel. Each of them behaved notably different than the characters they once portrayed (understandable, considering they are, in fact, actresses). Sirtis in particular was much more outspoken and gregarious than her Next Gen counterpart. As I mentioned above, not every Trek actor is familiar with the entire Trek canon, and these three fit that category to varying degrees. 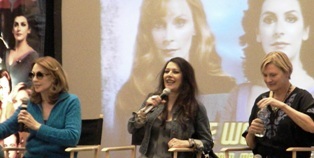 When asked what their favorite episodes were, Sirtis admitted that she had not watched any episodes because she has a hard time watching herself on screen. “I watched some of them!” McFadden tried to reassure the disappointed questioner. Despite their self-admitted lack of Trek knowledge, the three put on a good show, riffing off of each other and telling little stories about their time on Next Generation. 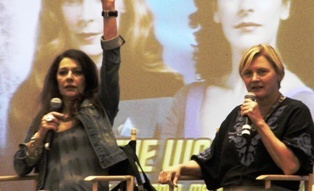 For the record, Sirtis softened her “I don’t watch Star Trek” stance when a young girl asked a question. When asked about what costumes gave them the most trouble, both Sirtis and Crosby agreed the Romulan costume was not their favorite. “Did the Romulan hairstylists only learn one haircut?” Sirtis joked. One of the more interesting questions of the afternoon was whether they thought Star Trek would be back on television. While none of them had any definitive news on the subject, they all seemed to have heard rumblings that Trek would indeed make a return to the small screen one day. “At some point when they are done with the current movies,” McFadden speculated. Let’s hope so. Rounding out the list of series regulars I saw over the weekend are Garrett Wang (Harry Kim) of Voyager and Nana Visitor (Kira) of Deep Space Nine. 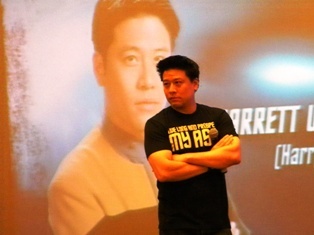 If you are at a convention and have a chance to see Garrett Wang, don’t miss it, even if you have never seen an episode of Voyager. He is very funny and open about his time on Voyager. He even jumped off the stage and made his way down the aisle, giving the people in the back rows the chance to snap closer-range photographs. kept the audience laughing with his tales from the set. One of the more interesting tidbits Wang shared was the directive given to the cast to underplay their scenes. In an effort to contrast the humans from the alien characters they were told not to act too emotional. Over the course of several seasons the actors were given more leverage, but I thought it was interesting they were essentially held back when they first started (to the point where they actually were forced to reshoot scenes when the producers believed they were over-emoting). 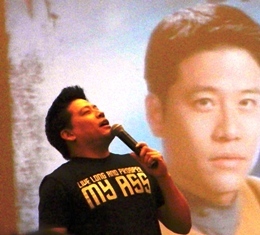 Wang also offered a humorous take on his efforts to get his character promoted. He asked the writers and producers why Ensign Kim never received a promotion, only to be told, “Someone has to be Ensign.” He went on the share some of his favorite scenes to shoot and some of his favorite moments from the show. Nana visitor, who immediately preceded Shatner’s show-closing appearance, took the stage to a packed audience. Out of all the guests I saw over the weekend, this was the one I was least familiar with. I have to admit that I never got into Deep Space Nine. I’m looking forward to giving it a chance when it finally makes its way to Blu-ray. But until then I only know little bits and pieces about the series. I noted how much Visitor, and her character Kira, had connected to the DS9 audience. Being a role model as a strong female character was something Visitor clearly took pride in. She also talked about being somewhat retired from acting, at least temporarily. She did mention having some desire to return to acting soon. Creation Entertainment’s Official Star Trek conventions are held in cities throughout the U.S. several times a year. For a complete list of upcoming events and celebrity guests check their official website.